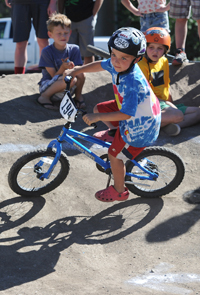 Sunday’s Idaho Pump Track State Championships attracted 84 riders to the Ketchum Bike Park, as the concluding event of the Ride Sun Valley Bike Festival weekend. Men’s Open (14-plus): 1—Brody Buchwalter 14.625 average. 2—Kyle Warner 14.94. 3—Duncan Fuller 15.485. Others were Alex LaFleur 15.625, Brad Pastor 15.65, Will Snyder 15.75, Blake Deilke 15.755, Blake Harmon 16.135, Burke Saunders 16.325, Shaw Dean 16.465, Brendan Coyle 16.705, Mike Breen 17.11, Hart Gibson 17.295, Pat Hurley 17.32, Jim Slanetz 18.72 and Adam Heaney 18.92. Women’s Open (14-plus): 1—Amber Marsh 17.455 average. 2—Beth Roberts 18.39. 3—Jen Biondi 18.83. Others were Mal Burda 19.78, Sallie Cobb 20.145, Brenda Mozygemba 230.635 and Brita Hubbard 21.175. Boys’ 13-and-under: 1—Shaw Dean 16.56 average. 2—Tyler Peterson 18.015. 3—Brody McBee 18.47. Others were Alex Guylay 18.855, Ethan Marx 20.72, Garret Olson 20.865, Slater Whitehead 21.03, Shea Slanetz 22.5, John Farretti 22.905 and Shaw McCoubrey 27.54. Girls’ 13-and-under: 1—Paig Heaney 21.825 average. 2—Laelle Novotny 23.055. 3—Lily Dean 24.44. Others were Gracie Gibson 24.545, Rachel Boaitey 27.415 and Marie Claire Ferrett 27.645. Boys’ 9-and-under: 1—Markis Shelton 19.35 average. 2—Max Meucci 19.685. 3—Noah Shelton 19.91. Others were Maxwell Rumer 20.5, Carter Dale 22.33, Braxon Dale 22.44, Ethan Desler 22.56, Whit Kelly 23.105, Finn McBee 23.785, Kai Van Buren 24.355, Jackson Booher 24.44, Juda Torres 24.94, Mark Relling 25.22, Caleb Allen 25.535, Zack Torres 25.575, Sylas Barrett 27.36, Thomas Harvey 27.61, Ryan Relling 27.905 and William Hubbard 28.48. Girls’ 9-and-under: 1—Kylena Paredes 23.17 average. 2—Olive Gilbert 27.435. 3—Hunter Ervin 30.575. Boys’ 6-and-under: 1—Carter Dale 16.815 average. 2—Kai Van Buren 17.205. 3—Thomas Harvey 18.485. Others were William Hubbard 18.92, Josh Gould 19.065, Wyatt Gilmore 20.36, Toben Galpin 20.64, Conrad Booher 21.35, Eli Pirzynski 23.055, Will Hausmann 23.61, Bridger McBee 24.595, Sam Gabe 28.47, Noah Baker 29.69, Will Lamoureux 34.87, Theo Galpin 38.57, Jeff Van Buren 43.16, Wyatt Limburg 43.97 and Thijs Lloyd 45.00. Girls’ 6-and-under: 1—Claire Buchwalter 19.095 average. 2—Jada Gould 21.84. 3—Kennedy Ervin 24.41. 4—Maddy Baker 31.00.